Governors Towne Club is the Thirteenth design in World Golf Hall of Fame Curtis Strange’s exclusive portfolio and represents a seamless collaboration with acclaimed course designer Michael Riley. The 7,250-yard Tournament Golf Course features dramatic elevation changes, cascading creeks and a dedication to preserving the environment influenced the strategic design of each hole. High flashed white sand in the bunkers enhances the striking aesthetic quality of the tournament grade presentation. Golf holes are flanked by a majestic forest of giant hardwoods and pines, 2 to 4 feet in diameter, isolating the natural beauty and graceful course topography while creating one of Atlanta’s purest golf experiences. Variety is the strength of the course, and the playability is intended to appeal to golfers of all skill levels and ages. Various hole lengths and pars and the changing contours of the site make club selection vary for each hole. 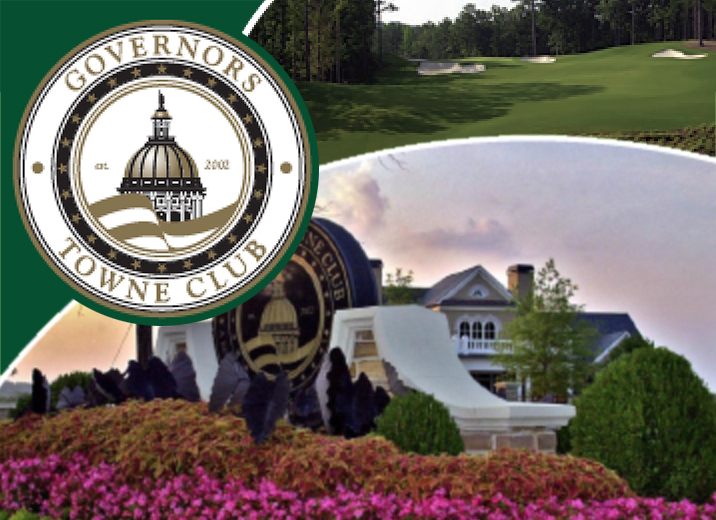 Strength of character, diversity and superior tournament conditioning distinguish Governors Towne Club as one of Georgia’s most exciting and memorable golf experiences. Men are required to wear shirts with collars and sleeves. Slacks or Bermuda shorts, and all shirts must be tucked in. Cargo-style pants or shorts, tank tops, tee shirts, fishnet tops, halter tops, cutoffs, sweat pants, jeans, short shorts, or other athletic shorts are not permitted! Any and all headwear must be worn face forward. All shirts must remain tucked in at all times. Women are required to wear skirts, slacks, Bermuda shorts and appropriate golf blouses.